The Time has come for what is probably Greenwood's Most Famous Property to Finally hit the Market...The Historic Mid-Century Modern "Mills Home", an Extremely Rare Architectural Marvel is AVAILABLE NOW!! 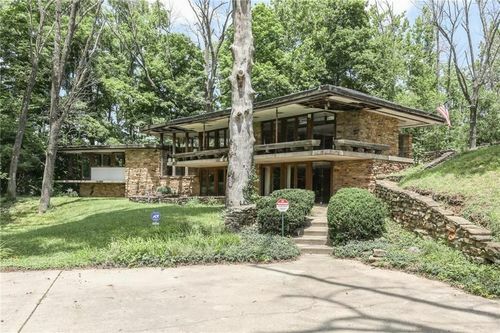 Renowned Indianapolis Architect, Harry Cooler consulted w/ the Famous Frank Lloyd Wright on the plans for this Landmark Property that sits on nearly 4 Gorgeous Wooded Acres. Design draws Nature Indoors by showcasing Natural Fieldstone Throughout, Floor-to-Ceiling Glass Windows, 2 Wood-Burning Fireplaces, Terazzo Floors, Mahogany Doors & Wrap-Around Cantilever Deck to Enjoy the Views! Great Location, Amazing Opportunity for a Historic Bed & Breakfast or Office. Be the talk of the town & Save this Piece of American History! MUST SEE TODAY!